This entry was posted in Business Tips, Mobile Marketing, Social Media. Bookmark the permalink. 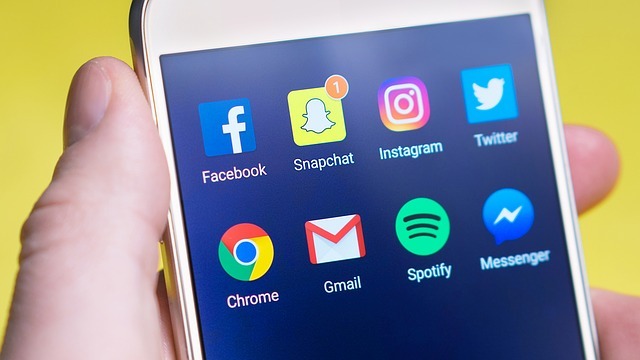 In a world awash in social apps, and more being created almost every day, Snapchat stands out as one of the most successful, in the top five in fact, right up there with Twitter, Google+, LinkedIn, and the biggest of them all, world-conquering Facebook. Launched in 2011, by the latter part of 2014 the app had 30 million active users and 60 million downloads, and over 40% of 18 year-olds in the United States were using Snapchat on a daily basis, multiple times per day in fact. The Snapchat saga is an interesting and informative story for any would-be Internet entrepreneur, a rags-to-riches (well, sorta) tale full of ups and downs, mostly ups, and infighting. For those unfamiliar with the app, Snapchat is a social media tool that allows its users to send photos and videos to each other. Nothing unique about that, but Snapchat’s gimmick is that they only live a short time. Users can set these posts to last for 0 to 10 seconds, giving the recipient a brief chance to view them, after which they are, supposedly, permanently deleted. This allows users to send sensitive and private pics and videos without having to worry about them being permanently available or seen by unwanted parties. Users can also chat by video, and it’s possible to set a post or a collection of posts to allow unlimited viewing for a 24 hour period, known as Snapchat Stories. That’s the basic premise, but Snapchat is always evolving and adding more capabilities. Snapchat began life in July of 2011 as the brainchild of Stanford University students Bobby Murphy, Evan Spiegel, and Reggie Brown, and was originally called Picaboo and for iOS only. It was renamed Snapchat two months later. The app caught on quickly, and began to attract the notice of some serious investors, among them Lightspeed Ventures, Benchmark Capital, and Institutional Venture Partners. The two main reasons put forth for the app’s phenomenal success are that it closely mimics the way communication works in real life, as person-to-person interaction lasts only a few seconds and then the moment is gone. Another is that parents and the older generation had discovered Facebook and had a large presence, and the younger generation was looking for a new place to play. Snapchat came on the scene at just the right time. In November of 2013 the Wall Street Journal reported that Facebook’s CEO Mark Zuckerberg offered $3 billion to acquire Snapchat, but was spurned. In the same month, it was reported that Google offered $4 billion to buy the app, but that offer was also declined. Snapchat’s rise to fame was not without some difficulties. Almost from the very beginning, the self-described ‘brogrammers’ had a falling out. Murphy and Spiegel, decided to cut Brown out of the deal, though Brown claimed to have originated the idea for the app. Not surprisingly this led to numerous lawsuits, the story of which is a saga deserving of its own article. The lawsuits were settled in 2014. Snapchat has continued to prosper, launching new features and versions, including an app for kids under the age of 13 called Snapkidz. As of February of 2018, there were over 300 million monthly users, 187 million daily, and more than 10 billion video views per day. As an advertising platform, Snapchat offers significant opportunities for businesses. Although a tad expensive, the exposure that ads get on the app is almost unparalleled. A feature called Discover offers content from major news and entertainment sites like CNN, People, Buzzfeed, ESPN, and many more. The content is ad-supported, and it’s estimated that the ads on the feature are viewed up to 1 million times per day. Ads can be sold within Snapchat Stories, and the app also offers geographically-filtered ads within individual snaps. In 2015 Snapchat signed a deal with the NFL to feature specific games within their Stories feature, another lucrative opportunity for ad placement. With no lack of funding or users, and plenty of money rolling in for development, it’s certain that the app will continue to add more features in an attempt to broaden its user demographic base. It may have been an application for kids in the beginning, but Snapchat has rapidly evolved into a marketing powerhouse that businesses can hardly afford to ignore.